Sorry to say this is our last (at least currently) bottle of the Domaine Virginie Thunevin AOC Bordeaux, 2009. On a beautiful fall Friday, this Bordeaux was a perfect option for one of our favorite meals–accompanying well-seasoned steaks, tender red baby potatoes, and blue cheese salads with the crumble, freshly ground pepper, and blue cheese dressing. 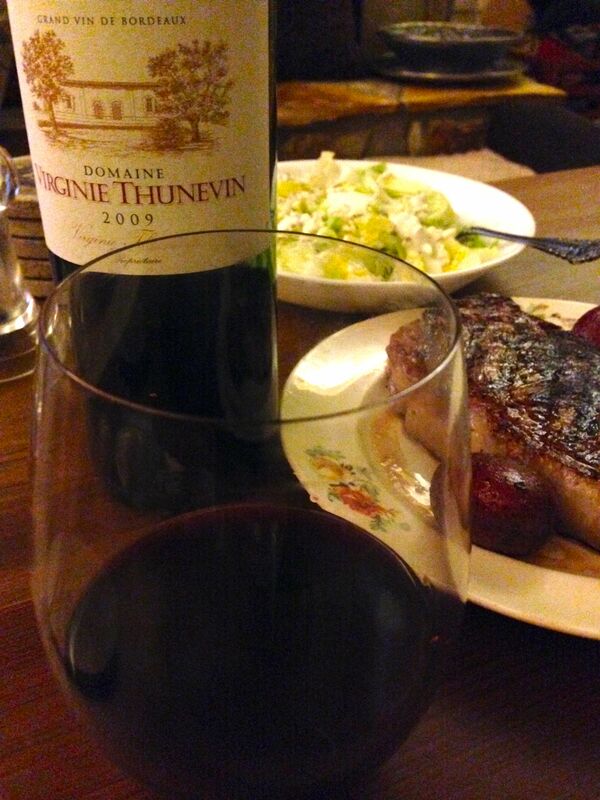 Domaine Virginie Thunevin AOC Bordeaux, 2009, France. Created by winemaker Jean-Luc Thunevin and named for his daughter, this Bordeaux combines Merlot (70%), Cabernet Sauvignon (20%), and Cabernet Franc (10%). It’s excellent when working alongside a medium rare, salted steak–and my lovely and talented chef (photographer too!) knows how to tease all the flavors out of a great cut. From a tasting standpoint, the 2009 Domaine Virginie Thunevin AOC Bordeaux is fruity and aromatic. The berries waft up, juicy and full on the nose, and–despite a hint of tannin in your first smell–it has a surprisingly smooth and easy finish. My wife thought much the same in her sampling. It is very drinkable to say the least. I think we’ve now had this Bordeaux with steaks on a few occasions, pizza on another, and I forget the other time. Thinking back (enviously, I must say) now, the 2009 Virginie seems to be very functional–you can drink it upscale with steaks or downscale with a casual pie and it complements both effectively. Wish we had another and you should too. This entry was posted in Bordeaux and tagged France, Jean-Luc Thunevin, red blend.